Our 20 acres of hilltop pasture that Bobby reclaimed from the encroaching forest some fifteen years ago are doing well, despite the lack of grazing animals. They were cleared and reshaped with a bulldozer back then, and seeded to orchardgrass and ryegrass, that he could remember. The forage cover I observed our first year of ownership was mixed grasses and forbs – low value weeds, mainly – none of which I could yet identify with any precision, with an occasional easy-to-recognize clover volunteer and a goodly number of invasive black cherry seedlings gaining ground. The forest always tries to come back. In many areas the cover was thin and enough bare ground showed on some of the slopes to merit beginning a pasture improvement program right away. Since we bought the farm in 2006, the hay harvest has been mowed and mulched twice a growing season, returning as much of the organic matter as possible to the soil where it can build tilth and add nutrients. I also disced and overseeded perennial ryegrass and red clover two years ago, to fill in thin spots and improve the nitrogen profile; the clover took well and should remain vigorous for another couple of years, and the ryegrass has added complexity to the mix of established grasses. A pasture walk while I was there in early June confirmed the stand is thick, the bare areas have filled in, and the clover-sown areas look just right. But a major problem remains. The primary cool-season grasses found in our area pastures are orchardgrass, bluegrass, some timothy, a little ryegrass, and tall fescue. 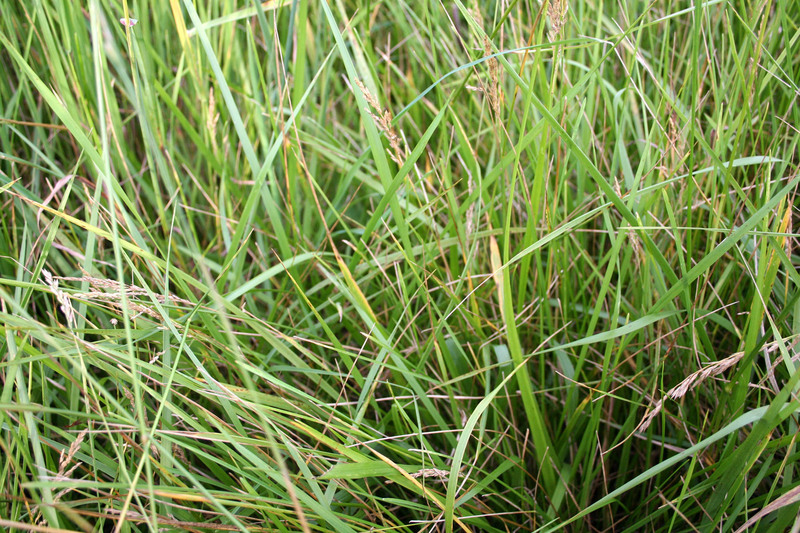 Though there are good stands of orchardgrass at the pasture edges, and a wide variety of different grass varieties can be seen throughout, the tall fescue predominates. It does this naturally, being a vigorous perennial bunchgrass that forms a tight sod, out-competing other species for sunlight and nutrients, and it has an unfair advantage, as well. 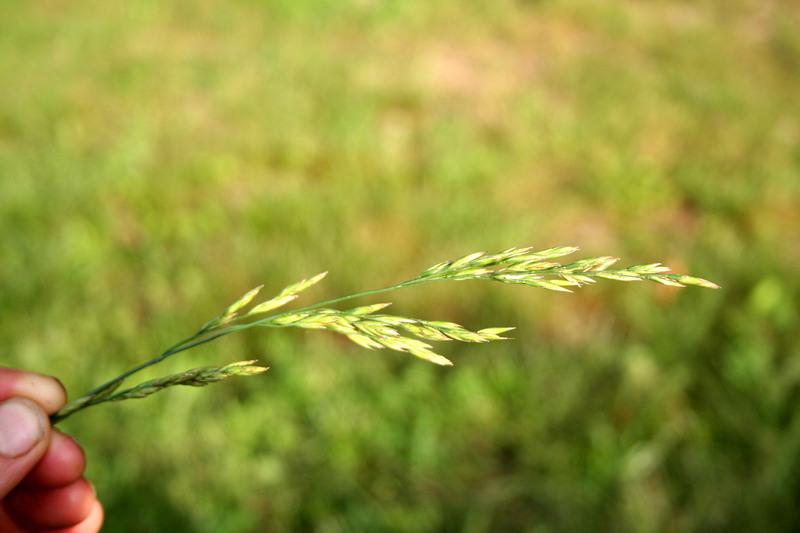 Most tall fescue is infected with an endophyte, a fungus that lives inside the plant cell walls and enhances the fescue’s vigor and survivability, making it a highly-productive forage plant. This was the characteristic that caught Dr. E.N. Fergus’s attention when he visited a farm in Menifee County, Kentucky in 1931 and observed an impressive tall fescue growing on a mountainside pasture. Dr. Fergus took seed from that hillside back to the University of Kentucky and subsequently tested and released the ‘Kentucky 31’ variety of tall fescue in 1943, which was vigorously promoted by the University’s Extension Agronomist and widely accepted by Kentucky farmers. During the next two decades there was great interest in and planting of ‘Kentucky 31’ throughout the lower Midwest and much of the South, as this new variety was more vigorous and better adapted than other cool-season grasses available. It was not the great grass they thought it would be, however. Palatability to livestock was disappointingly low, and performance of animals grazing it suffered, though no one knew why. Cattle grazing fescue would sometimes go lame, referred to as “fescue foot,” and would also more often exhibit an unthrifty condition in the summertime, called “summer slump,” eating less and having difficulty staying cool. In horses grazed on fescue, reproductive performance was especially affected: pregnant mares often aborted, or carried too long and had difficult births; foals were sometimes stillborn, and milk production inadequate. These toxic effects of fescue on horses and cattle were observed and recognized, but the cause was not known and remained a mystery for many years. Research finally revealed in 1976 the source of the toxicity: the fungus Acremonium coenophialum, an endophyte that grows inside the fescue plant and produces alkaloids that protect the grass from insects and nematodes, making the plant more tolerant to marginal soil environments and poor conditions. What is good for the grass in this case is not good for the grazers: the alkaloids are the cause of “fescue toxicosis,” which negatively impacts feed intake and heat regulation for cattle and causes serious reproductive problems in horses. Nearly 80% of the fescue in Kentucky pastures is infected with this endophyte. So most, but not all. And new varieties have been developed that either have no endophyte, or have a less toxic one instead. But the endophyte-infected fescue (E+ fescue) is persistent and vigorous and once established, is difficult to eradicate. It can be done, but it usually involves chemically killing the entire forage stand, planting a smother crop, re-killing any remaining fescue, then re-seeding an alternate variety. Or, the percentage of E+ fescue can be reduced and controlled by cultivating and overseeding/interplanting clovers and other grass varieties, suppressing the seed-producing stage by mowing (the endophyte propagates through the seed), and grazing at early stages when the endophyte is at lower levels (stems and seeds contain the highest levels of toxicity). With careful management, a grazier can drastically lower the percentage of infected fescue, rebalancing the forage mix so other varieties predominate, and do much to minimize the negative effects of any remaining E+ plants. Since I’ll be grazing and making hay for both horses and cattle, I’ve been especially concerned with determining how much fescue is in my pastures, not an easy task if you don’t know your grasses. I’m learning them, slowly, and the truth has been disappointing, as it has become clear I have lots of fescue which means I have a lot of work to do before the mares will have adequate pasture. Clicking on the picture in the previous post, those graceful side-bending seedheads you see, all fescue. Yes there’s some ryegrass there as well as a nice clump of timothy in the right foreground, and at a different time of year other grasses are in growth and the fescue is not center stage. And I haven’t had it tested yet to see what level of infection it has. But it is a beautiful, thick, healthy stand of mostly tall fescue I can safely assume is toxic enough to worry about. Since I’d rather drink a gallon of Roundup than chemically burn the diversity and micro-life that is my pastures, I have my work cut out for me. Nothing done well and with care is quick and easy.